If you thought fashion shows were about slender models balancing on pencil-thin heels and flaunting designer finery, then think again. The catwalk routine underwent a crazy makeover this Dubai shopping festival, with the fashion experts tweaking the traditional fashion runway for something extraordinarily stunning. In fact, the fashion ramp has never quite evoked such thrill and drama, ever. A select group of Dubai’s fashionistas witnessed this historical show as six acrobats scaled the majestic Burj Khalifa in musical synchrony on the cold, chilly Monday night. The magic unfolded just minutes after the 8pm musical fountain show had ended. The spotlight quickly shifted to the glossy pillars of the tallest tower as the acrobats, dressed in golden, shimmery body suits, enthralled and mesmerised with their swift choreography. They turned the shimmering steel walls of the Burj Khalifa into their ramp, taking turns into break into a rhythmic drill. The group took only two breaks, during which, 10 gorgeous models strutted their stuff on the catwalk. They paraded designs from Ingie Paris, Christian Dior, Prabal Gurung, Alaia, Issa, Amanda Wakeley, Raoul, Collette Dinnigan, Safiyaa, Kotur and Elizabeth & James. The focus, however, was more on the thrilling acts of the acrobats. They ended their performance by shading the Burj Khalifa in colours of the UAE flag, as two of them walked down the tower with their DSF shopping bags in hand. 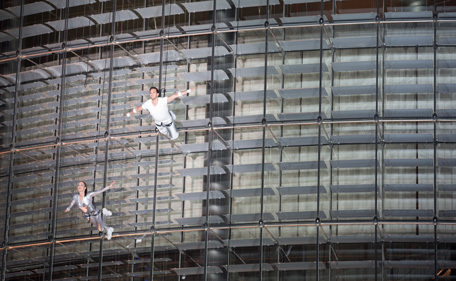 The vertical catwalk, which is touted to be the first of its kind, is another feat on Dubai’s fashion map. The vertical catwalk, which has definitely taken Dubai’s fashion scene to glorious heights, was hosted by Etoile “La Boutique”, Burj Khalifa and Paris Gallery.